Le Clarys Plage is a 5 star campsite located in Saint-Jean-de-Monts in the Vendee region of France. 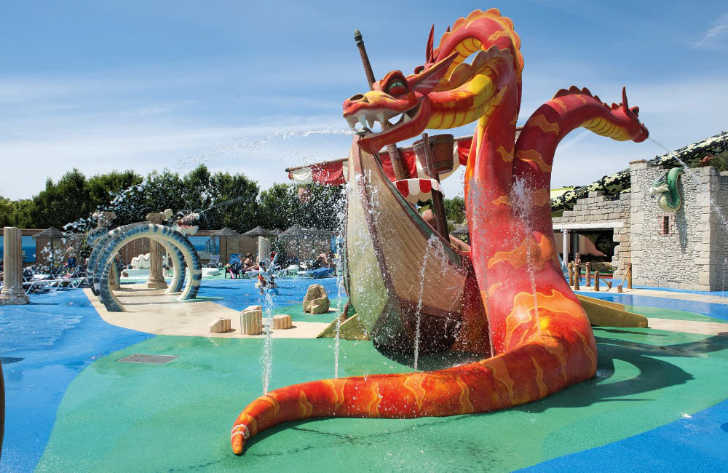 Le Clarys Plage is a superb fun-filled, family friendly campsite that has a great position near to the Atlantic Ocean. The campsite is a firm favourite with families of all ages, many of whom return year on year. This is because of the fantastic location and the vast array of activities and facilities on-site and nearby. There’s plenty to see and do nearby to the campsite. Furthermore, you’ll find that the area has a vast number of different cycle tracks. This is useful in travelling from one place to another or exploring. Within walking distance of the Le Clarys Plage there are several shops and restaurants. The nearest supermarket is at the rear of the campsite where a coded gate gives direct access to the store’s carpark. One of the great things about Le Clarys Plage campsite is its proximity to the nearby beach. Les Mouettes Plage is the closest beach which is just a few hundred meters walk away. The beach is long, covered in glorious sand and lifeguarded during high season. However, if you are unhappy or unable to walk to the beach, there is a free car park at the entrance. Further away from the campsite are a myriad of different beaches. All lie within a few kilometres including almost an 8km stretch at Saint-Jean-de-Monts. There are many reasons that families visit Le Clarys Plage. The main however is because of the fantastic swimming pool complex that lies at its heart. 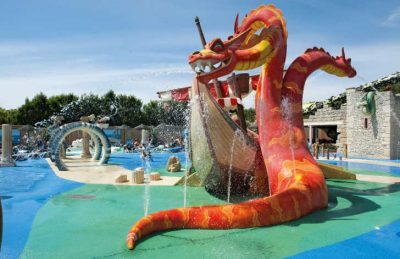 A dedicated pool for younger children with a selection of slides, a family pool with yet more slides, a splash water jet area with a giant red dragon, a lazy river, indoor pool, a fantastic boa slide and plenty of seating areas are present at this fantastic family campsite. Le Clarys Plage campsite offers a comprehensive selection of activities and facilities on site and also nearby to ensure you have a fantastic family holiday. On-site activities at Le Clarys Plage campsite include tennis, table tennis, football, basketball, volleyball, boules, outdoor gym, playgrounds and bouncy castles. Facilities available at Le Clarys Plage campsite include WIFI, restaurant, snack bar, takeaway, bar, groceries, games room, tv room, animation team, washers and dryers. Accommodation at Le Clarys Plage campsite includes a range of 2 and 3 bedroom mobile homes and tents available from Eurocamp, Al Fresco Holidays and Brittany Ferries.